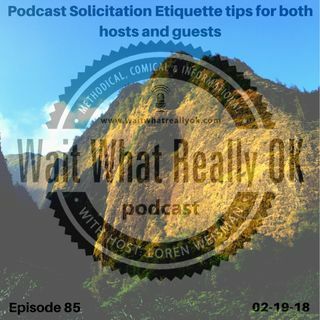 Wait What Really OK Podcast Episode 85 hosted by Branding Strategist and Keynote Speaker Loren Weisman goes into the good and bad of solicitation and requests when it comes down to being a guest or pitching a podcast to find guests. In a day where there are so many podcasts and shows out there with so many advertising for guests or guests trying to get on shows, the oversaturation has become a bit much and the message gets ... See More lost. In this episode, Loren digs into some simple podcast solicitation etiquette tips for those looking for guests and those that are looking to be guests on different shows. By considering how many people are pushing spam style messages or trying to look too cool for school, then shifting to a more authentic and engaging request, your connections and conversions can be worlds better. Episode 85 of the brand management and marketing podcast Wait What Really OK is titled Podcast Solicitation Etiquette tips for both hosts and guests. The show is available on iHeartRadio.